There are two main types of window collision mortality. The first happens by day, when birds crash windows because they see reflections of the landscape—trees, sky, clouds—on the glass surface, they see through the glass to potted plants indoors, or they see the landscape on the other side of the building through a second window. The second type of potentially fatal collision happens by night, when nocturnal migrants (including many of our most beloved songbirds such as tanagers, orioles, and catbirds, and warblers) hit lighted high-rise windows jutting into their airspace. Some of these nighttime collisions are due to simple random chance, when a building happens to be directly on a bird’s flight path. Much more often, nocturnal migrants are actively lured to their deaths by lights within these tall buildings. For reasons not entirely understood, nocturnal migrants, who navigate by the stars, are often diverted from their original path by lights, especially in low-ceiling or foggy conditions; in the lighted area, they mill about, often colliding with one another or the lighted structure. Hundreds or thousands of dead birds may litter city streets after some migration events. 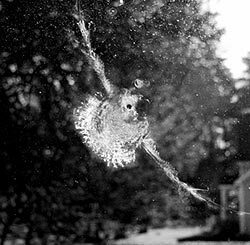 A third type of window collision is far less likely to end in mortality, but is harmful to birds and annoying to humans witnessing it—when a bird attacks its reflection in a window. This occurs during daytime, most often in spring and early summer when birds are defending their breeding territories. The species that do this often, such as Northern Cardinals, American Robins, and California Towhees, tend to be territorial species that nest very close to buildings, and so are the ones most likely to notice their reflection and perceive it as a territorial rival. Some birds such as swallows, starlings, House Finches, and House Sparrows also nest close to buildings, but these are more colonial and far less territorial, unlikely to fight with one another, much less a reflection. Territorial battles with windows may be so strong that a bird may exhaust itself or leave you frantic, but these collisions usually don't result in fatal injury. The best solution, which will also prevent fatalities from other kinds of window collisions, is to cover the outside of the window with netting or screening so the reflection is no longer visible or the bird is held too far from it to hurt itself or be such a nuisance for you. You can also try drawing soap streaks across the window to break up the reflection. This territorial reaction may be so strong that the bird may exhaust itself, but it usually doesn't result in fatal injury. Window collisions (above) are much more serious. Window strikes are something you should be aware of and try to prevent; you have an added responsibility if you feed wild birds in your backyard. Start by identifying dangerous windows. Large picture windows or a pair of windows at right angles to each other on the corner of a house or other building are usually the worst culprits. Go outside near your feeders and look at your windows from a bird's point of view. If you see branches or sky reflected in or through the glass, that’s what the birds will see, too. 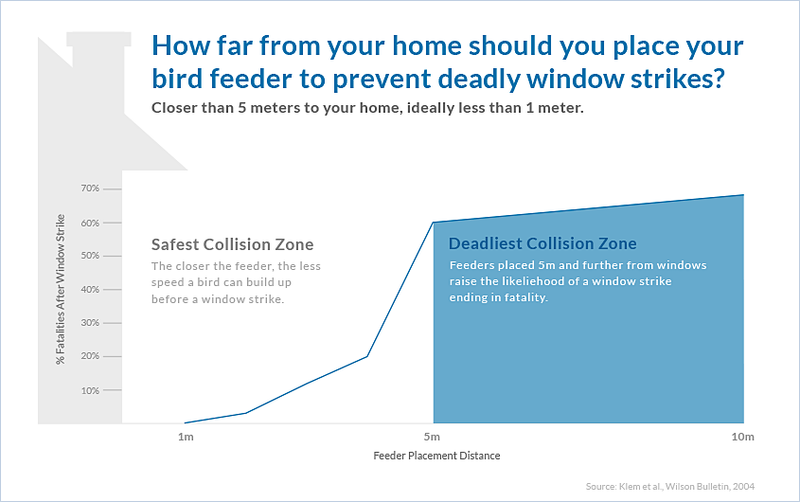 Relocating bird feeders can prevent deadly window collisions. Click on the image for a bigger picture. Relocate feeders and other attractants. Without changing your window, you might be able to reduce mortality, at least by resident birds, by moving your feeders and birdbaths to new locations. Bird strikes are significantly more likely to be fatal when they take off far enough away from the window to be flying at top speed when they hit. When feeders are placed within 3 feet of window glass, or affixed to the window or frame, birds may still fly into it, but seldom with enough force to injure themselves. Cover the glass on the outside with window screening or netting at least 2-3 inches from the glass, taut enough to bounce birds off before they can hit the glass. This can be extremely effective. 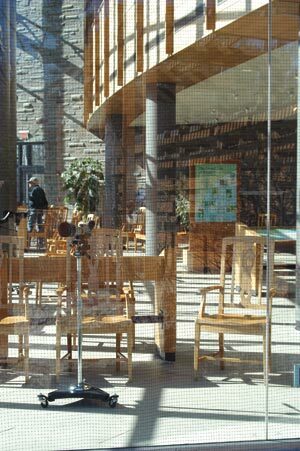 The Cornell Lab of Ornithology installed crop netting—the kind used to keep birds away from fruit trees—in front of a large picture window next to our bird-feeding garden. The result? No more dead and injured birds. Small-mesh netting is best—ours is 5/8" (1.6 cm) in diameter—so if birds do fly into it they won't get their heads or bodies entangled but will bounce off unharmed. You can mount the netting on a frame, such as a storm-window frame, for easy installation and removal. Cover the glass with a one-way transparent film that permits people on the inside to see out, but makes the window appear opaque on the outside. You can find information about the best available products on the Fatal Light Awareness Program website. Make sure these kinds of products are mounted on the OUTSIDE of the glass. Install external sun shades or awnings on windows, to block the reflection of sunlight. 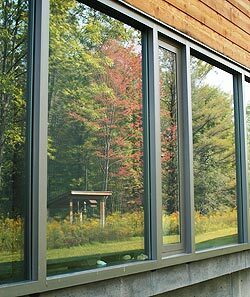 On new construction or when putting in new windows, consider double-hung windows, which have the screen on the outside of the glass. Alternatively, you might be able to ask your contractor to construct the window so the glass angles downward and doesn’t reflect sky and trees. Unfortunately, in some cases this may void the warranty on the window. Put decals, stickers, sun catchers, mylar strips, or other objects on the outside surface of the window. These are only effective when spaced very closely—no more than the span of a large hand between them. The design of a decal or sticker is immaterial. Hawk silhouette stickers are probably no more or less useful than any others. Some stickers sold in bird-feeding stores are colored in the ultraviolet spectrum—these appear transparent to our eyes but are visible to birds. Remember: placing just one or two window stickers on a large window is not going to prevent collisions—they must cover most of the glass with the spaces between too narrow for birds to fly through. 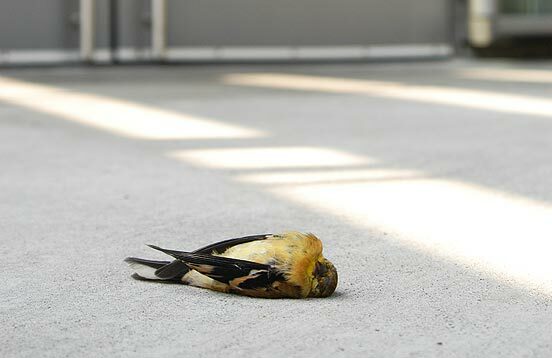 If you find a bird dazed from a window collision, examine it for external injuries. If the wings are both held properly, neither dangling, and the eyes seem normal, see if it can perch in a branch unassisted. If so, leave it to recover on its own. If the bird has a noticeable injury, get it to a rehabber as quickly as possible. Broken bones usually need proper attention within minutes or hours to heal properly without surgery. Use this online directory to find a rehabber near you. Meanwhile, place it in a dark container such as a shoebox, and leave it somewhere quiet, out of reach of pets and other predators, for 15-minutes. If the weather is extremely cold, you may need to take it inside, but don’t keep the bird too warm. Do not try to give it food and water, and resist handling it. The darkness will calm the bird while it revives, which should occur within a few minutes unless it is seriously injured. But do not open the box indoors to check on it! Take it outside every 15-minutes or so and open the box—if it flies off, that’s that! If it doesn't recover in a couple of hours, take it to a wildlife rehabilitator. Remember that, technically, it is illegal to handle a migratory bird without a permit. Few state or federal officials are concerned with keeping a bird for a few minutes or hours in the process of bringing it to a licensed facility, but in the United States it is absolutely illegal, as well as cruel and unethical, to keep in captivity any bird protected by the Migratory Bird Act. If you have questions about birds that we haven't covered here, try our Frequently Asked Questions section.